I started researching some ideas for creating a Clean and Simple (CAS) project for this week's challenge at Heart2Heart Challenges and found this tutorial for a spray misted dyed card. I loved the look so I made it my own by using CTMH products to create my own version! 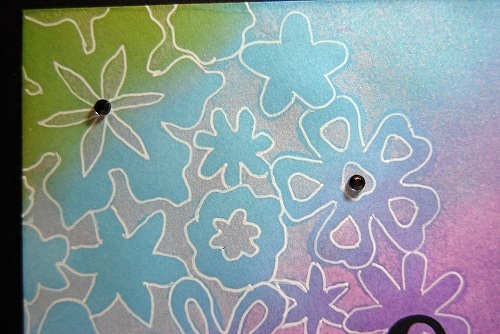 I blended four colors of ink (Ruby, Gypsy, Crystal Blue and Pear) on to a piece of White Daisy cardstock. I then took a 6" flower lace die cut from the Art Philosophy cartridge and laid it over my inked piece and misted it using water mixed with our Pearl Paint. To pop the color difference a little more I used a white gel pen to doodle outline my flowers and then stamped the sentiment in black pigment ink. A couple of sparkles colored black with a Sharpie marker cap off the look. 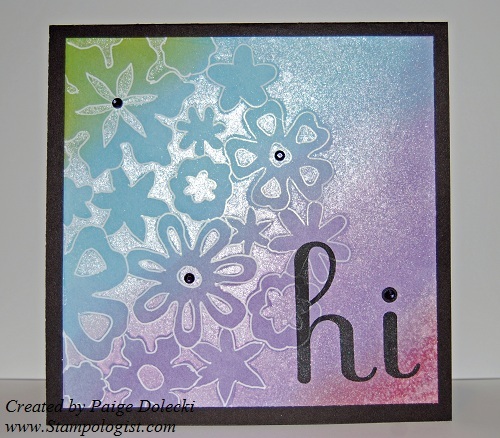 I love the shimmer the pearl paint gives the misted areas and the contrast with the die cut resist. Now hop on over to the Heart2Heart Challenge blog and check out the other CAS creations made by our Design Team. Then grab some of your Close to my Heart products and create a CAS project of your own to share with us! If you need to pick up some more CTMH goodies or if you just want to browse the new Idea Book, visit my website at www.Paige.CTMH.com. Thanks for stopping by today! Stay crafty by friends! Ink: Ruby, Gypsy, Crystal Blue, and Pear Dye Inks. Black Pigment Ink. I literally drooled when I saw this card! It is gorgeous. Thanks so much for sharing how you did it. I just adore the color scheme and the white gel pen doodles. LOVE it, Paige! Stunning card, Paige! I love the bold colors with the black accents. Thanks for explaining how you did it. I'm pinning this onto my Made with Art Philosophy board! Thanks for the inspiration! WOW this card is STUNNING!!!! I love it and plan to scrap lift it soon THANKS for the inspiration!! Wow! Love all the color on this, Paige, and all the shimmer & shine! Thanks for sharing this awesome creation! Really pretty card Paige! Love that tie dye technique! Happy Stamping! Pretty colors and card, Paiger! This is really beautiful! Love the colours you chose. Thanks for explaining how you made it!